The New Zealand Police is essentially an unarmed service, but firearms are used when required. 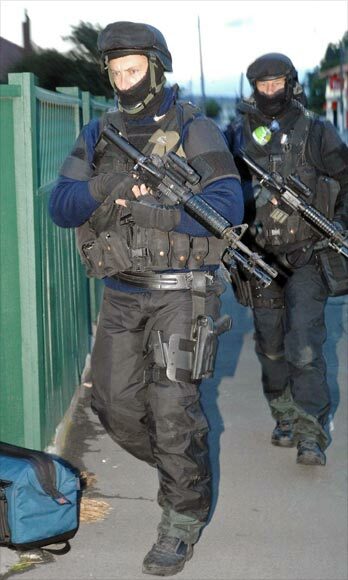 Here two members of the Armed Offenders Squad (AOS) leave a Napier street where a senior constable was killed and two others seriously injured by a gunman in 2009. They are carrying M4 carbines, plus pistols in side holsters. The AOS was formed in 1964 following the deaths of several police officers in shooting incidents. Its members are volunteers and serve in other branches of the police when their firearms training is not required.